If you are in the market for a pressure cooker, you need to know about today’s deal. The Instant Pot 6-in-1 Pressure Cooker is 30 percent off today; that is, actually available for a mere $70. As the “6-in-1” name implies, this device has many different functions: this pressure cooker is also a sauté/browning machine, a slow cooker, a rice cooker, a steamer and a warmer. This is not just a popular product when it comes to pressure cookers. It is actually the #1 best-seller among all kitchen and dining products. People LOVE this thing. The listing has almost 3,000 customer reviews, with 80 percent giving it five stars, good enough for a 4.6-star average. Don’t believe me? Check out some of the reviews. ***Update*** March 12, 2016…we’ve now had the unit for four and a half years, and it still works perfectly. Virtually no issues at all. Cheers! I cannot say enough about the Instant Pot. My wife and I owned another unit from a different company, but it’s pot was made of aluminum (tied to Alzheimer’s issues) and had a non-stick coating on it besides. We wanted a stainless steel pot to avoid all this…enter Instant Pot. My wife and I have chosen to make almost all of our dinners with the Instant Pot…it is easy to clean, easy to use, and requires virtually NO oversight. It is inexpensive to use as well…when using your stove and/or oven, you will notice a marked increase in the temperature of your kitchen, and with the oven, it will be very noticeable indeed. The Instant Pot doesn’t do this because it operates in a sealed environment, thus using far less energy as well. Because you can saute in this newest model, you can do almost all the cooking in this one pot, thus making cleanup far easier, as the inner stainless steel pot (but NOT the unit or it’s lid) are dishwasher safe. Also, once one is accustomed to using this unit, you can bring it with you on trips, and use it to cook food in a hotel room or a friend’s house. The Instant Pot is wonderful for this one fact if nothing else…once the food is in and the unit is pressurized, you can walk away…no stirring, no tending whatsoever. There is ONE time when you might have to pay attention. IF your Instant Pot is warm from previous cooking, i.e. you just used the saute function to brown something, or maybe you bought an extra inner pot (more on this below) and are cooking meals back to back….you may have to pay attention to make sure the unit seals properly. 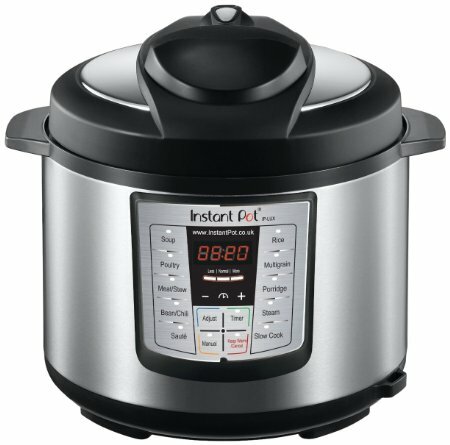 Sometimes, and this is NOT unique to the Instant Pot, if the unit is already warm, it may get confused and think that it has pressurized. I think you’ll find that you used the saute feature before turning it on. So…if the unit is warm/hot from any previous cooking, try this. Watch to see if the unit pressurizes (you’ll see the valve pop up)…if the unit starts counting down the cook time BEFORE it has sealed, hit cancel, and start your unit over. It should work the second time. If the unit is completely cool and your recipe requires no sauteing, it will almost always work the first time, but if not, this will work. This is the ONLY “issue” that I’ve encountered, and since it happened with another manufacturer’s model as well, I can only assume this is common for electric cookers. All in all, a small compensation to make. Compared to normal cooking where one has to constantly hover over the stove, this is minor indeed. I also HIGHLY recommend that you purchase the book “Everything Pressure Cooker Cookbook” from Amazon at http://www.amazon.com/Everything-Pressure-Cooker-Cookbook-Series/dp/1440500177 ——we use recipes from this all the time, and although they are designed for a stove top pressure cooker, they basically translate over perfectly. The only consideration is the cooking instructions…because the author is using a stove top cooker, she references a low/medium/high setting which does not apply on the Instant Pot, or on any other electric pressure cooker I’ve seen. Just use the appropriate setting for the Instant Pot, i.e. if you’re cooking beef, use the meat/stew setting. If chicken, use the poultry setting. I usually add about 20% more time as well, so e.g. if a recipe says put your beef stew on high for 30 minutes, put it on the meat/stew setting of the Instant Pot, and take 30 minutes x 1.2 = 36 minutes for your time. With pressure cookers, you can’t “dry out” your meat, and the reverse rules apply…i.e. if you’re meat seems dry, cook it LONGER. None of the moisture can escape because it’s in a sealed environment. Enjoy! This appliance has changed our lives, and I don’t say that lightly. Once you get good at using it and have recipes you like, it’s an awesome little appliance which we use CONSTANTLY. I have owned 8 different pressure cookers over the years, including an earlier version of the Instant Pot as well as the now-ancient oval (90 degree insert inside, pull up, turn back and clip-lock) lid with weight back in Europe in the 70’s. This, so far, is the best pressure cooker I have yet seen. It functions as a slow cooker, as an above-average quality rice cooker and -let’s not forget- a really good pressure cooker. Back to the pressure cooker… Some of the software limitations of the previous Instant Pot were fixed (namely, having to push the button for each and every minute, with only a 60 minute maximum timer – that was maddening). This control panel lets you click&hold and very quickly fly through the times, up until 120 minutes. It does fly through 0, so you can go up or down the shortest path to your desired time. Much, much, MUCH more convenient to use than the “manual” type pressure cookers where you have to stand by until you hear the pressure has built up, then start the counter, then turn it off when it is done. This thing does everything on it’s own. Put the food in, set the desired cooking time, press start. Leave for work, come home and it is done (with stand-by heat so as to avoid spoilage). Virtually silent, you also have almost no food smell coming into your home during cooking, thanks to the internal pressure sensor. Psst, psst, psst sound gone. Extremely energy efficient (much more so than the stove-top models, as you are heating only the inside, not the surrounding area. Energy savings multiplier during the summer, as you don’t have to cancel out the cooking heat with air conditioning the way you would with gas stove types that heat up the kitchen. Very easy to clean – since only the pot has to be cleaned, it fits in the dishwasher better than the stove-top type with handles. Ladies and gentlemen – this thing is officially awesome.